On April 28, 4th Marines arrived in Acapulco harbor. Reinforcements subsequently arrived in Mzatlan a week and half later. The regiment continued to maintain a presence in Mexican waters patrolling the shore through May and June. However by the end of June no landing had been deemed necessary and tensions had eased between Mexico and the United States. Shortly thereafter 4th Marines withdrew from Mexican waters and concluded their first Latin American expedition. The regiment returned to San Diego, California to establish its new home base. Between this time and February 1916 the regiment conducted several missions of force projection off the coast of Mexico. None had required the Marines to actually disembark as diplomatic relations were subsequently smoothed over upon their arrival or shortly thereafter. The Dominican Republic broke out in civil war in the spring of 1916. American forces were sent to quell the danger posed to Americans and other foreigners there. As the Americans came ashore the rebels withdrew from Santo Domingo, the capital, to Santiago where they had established another rival government. American forces called for reinforcements and 4th Marines was called into action. They left San Diego on June 6 for New Orleans. Three days later they boarded the USS Hancock (AP-3) for the Dominican Republic. The 4th Marines had been stationed in North China in the late 1930s, evacuating from Shanghai to Manila on 30 November 1941. With its 3rd Battalion inactivated in China in 1934, and further reduced by unreplaced separations from the service (replacements were instead diverted at the direction of the 4th's commander to the 1st Special Defense Battalion in the Philippines), it consisted of only two battalions, each with only two rifle companies of two platoons each and one machinegun company. The 4th Marines absorbed the Marine Barracks Olongapo on 22 December 1941 to fill out the 1st and 2nd Battalions to three rifle companies of three platoons each, then added the 1st Special Defense Battalion at Cavite to create the 3rd Battalion. The 4th Marines then were moved to Corregidor where on 10 April 1942 it added the 4th Provisional Battalion composed of U.S. Navy personnel that had previously served during the Battle of Bataan as the Provisional Naval Battalion. When the Japanese defeated allied forces in Bataan on April 9, 1942, they shifted their focus to Corregidor Island. The island was essential to the invading Japanese forces, as it was the last remaining obstacle to Manila Bay, known as the finest harbor in the Orient. The regiment was composed of troops from 142 different U.S. and Filipino organizations with nearly 4,000 men with the regiment occupied the island at the time, but more than half were Army and Navy personnel without ground combat training. Approximately 1,500 U.S. Army and Philippine Scouts personnel reinforced the regiment during the defense of Corregidor, designated as the Reserve Battalion. On May 5, Japanese soldiers landed on the island and faced fierce resistance from American and Filipino artillery, but with persistence the Japanese forces etched their way deeper into allied territory and eventually overcame one of the regiment's artillery batteries. Early the next day, Japanese tanks made it to shore. Army Lt. Gen. Jonathan Wainwright, the commander of U.S. forces in the Philippines under Gen. Douglas MacArthur, realized his men's defeat was imminent. Just a day after the invasion, he surrendered for fear that the more than 1,000 wounded troops would be captured or killed. The 4th Marine Regiment was utterly destroyed, and only a few surviving Marines and personnel made up what was left of the regiment. The regiment was subsequently dissolved under ill-fated control of its own accord. The commander of 4th Marines ordered the burning of the colors before they made their hasty evacuation. 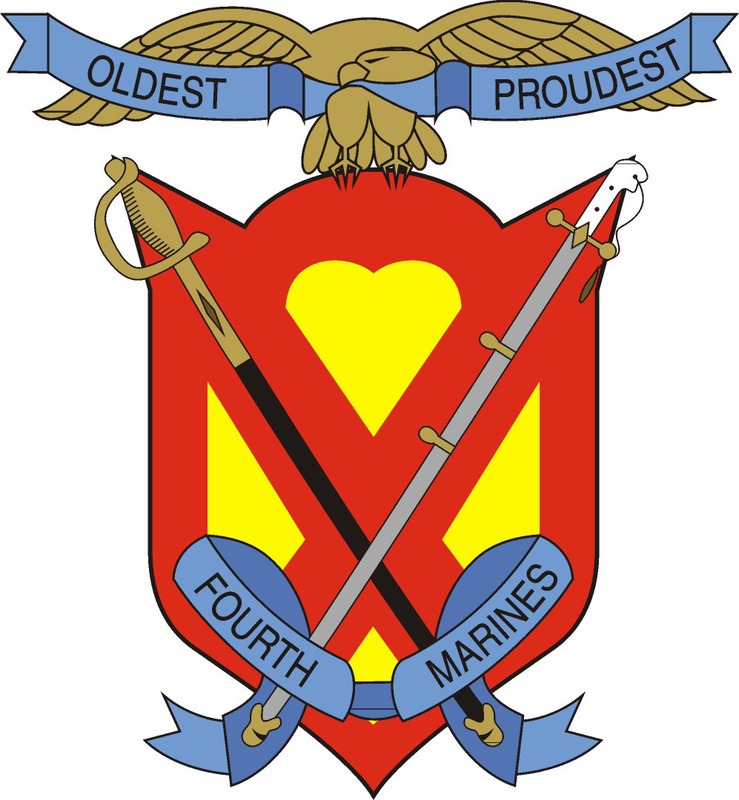 By 1 February 1944, four Marine Raiders battalions were amalgamated into a re-established 4th Marine Regiment, bearing the name and honors of the original 4th Regiment lost in the Philippines in 1942. The 1st, 4th, and 3rd Raider Battalions became respectively the 1st, 2nd, and 3rd Battalions, 4th Marines. The 2nd Raider Battalion became the regimental weapons company. 4th Marines, combined with the 22nd Marine and the 29th Marine Regiment, was assigned to the 6th Marine Division and fought at Guam and Okinawa. After the end of World War II, the 6th Marine Division was deactivated, also dissolving the regiments under its operational command. 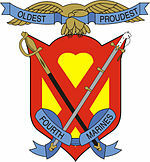 In 1951 the 4th Marines were reactivated carrying the honor and lineage of both the old and new 4th Regiments. The 4th Marines served in the I Corps region of South Vietnam as part of the 3rd Marine Division, under the III Marine Amphibious Force. They landed in the spring and summer of 1965 near Chu Lai. The regimental headquarters was first at Da Nang, then in 1966 the HQ was moved to Phu Bai. In 1967 the regiment made its final move to Dong Ha, just below the Demilitarized Zone (DMZ). There the regiment participated in many large operations throughout Quang Tri Province from the South China Sea to the Laotian Border along the southern half of the DMZ. During this period of time the 4th Marines were also providing security for the construction of the McNamara Line. Some of the major operations that the regiment was involved in were Operation Starlite (August 17–24, 1965), Operation Hastings (July 15 – August 3, 1966) and Operation Prairie (August 3 – October 27, 1966). Other major operations in 1967 and 1968 were Operation Prairie IV (April 20 – May 17, 1967), Operation Hickory (May 18–28, 1967), Operation Kingfisher (July 16 – October 31, 1967) and Operation Kentucky (November 1, 1967 – February 28, 1969). The two major enemy units they battled over those years were the 324B NVA Division and the 320th NVA Division. The regiment left Vietnam in late 1969 with 10 Marines and 1 Hospital Corpsman having received the Medal of Honor. ↑ CW2 Mark J. Denger. "Here to Stay". California State Military Museum. California Military Department. Archived from the original on 13 June 2011. http://web.archive.org/web/20110613050348/http://www.militarymuseum.org/SDMarines.html. Retrieved 11 July 2011. ↑ Leatherneck Magazine, 4th Marines explore historic Philippine battle site, February 1, 2007. Condit, Kenneth W.; Turnbladh, Edwin T. (1960). Hold High the Torch – A History of the 4th Marines. Washington D.C.: Historical Branch, Headquarters Marine Corps.